The Fremont Plaza Hotel in Downtown Las Vegas was formerly a Motel 6, I am not sure if that is good or bad, did they fail inspection and get kicked out of the Motel 6 high standards? Or did they want to shed the name and show they are better than a motel 6? Let’s face it this place is a last resort hotel but its a place to sleep and if the rate is right when the rest are not, book it. 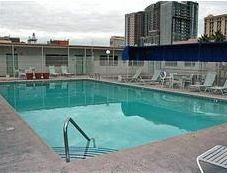 The hotel is a short walk to the Fremont Street Experience but should not be made alone and never at night.